Copyright © 2000 D.J. Eernisse. All Rights Reserved. Cladograms and networks are two ways to portray relationship (genealogy) between taxa. We commonly call such diagrams trees. Cladograms are rooted trees whereas networks are unrooted (see below). On this page we will cover only cladogram styles. Cladograms and networks can be portrayed in a sometimes bewildering diversity of styles. You are not alone if you find their interpretation confusing. The following overview will help focus attention on the important aspects of cladograms that remain the same, regardless of their differing styles. Cladograms A-D below are identical, just drawn in differing styles and orientations. Figure A uses diagonal branches whereas Figures C and D use rectangular branches. Figure B is an intermediate style. Figure C is rotated 90 degrees relative to the others. Still all of these cladograms are identical. All that matters with cladograms is the pattern of joining sister taxa together at nodes. 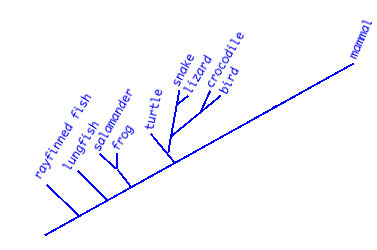 Notice that all of the cladograms join bird and crocodile together at a node, making them sister taxa. Likewise, in this cladogram at least (*), snake and lizard are sister taxa. In all four cladograms, the clade (bird + crocodile) is sister taxon of the clade (lizard + snake). That is, these two clades join at a node. Find the part of each cladogram with these taxa. Notice that the rectangular cladogram style always has a node at a perpendicular intersection of a vertical and horizontal branch. Notice that Figure B is slightly taller than Figure A. This difference means nothing, because the vertical axis means nothing. That is, it doesn't matter how long the branches are drawn. The only thing that matters is which taxa join at nodes. Likewise, the horizontal axis means nothing. You can draw cladograms as fat or as skinny as you like and it will not change the cladogram, provided the sister taxon relationships are the same. While there are certainly many other styles of drawing cladograms, it may be useful to also contrast some other less desirable styles that are typical of those drawn by students just learning about cladograms. For starters, consider the following cladogram. This is almost the same cladogram too, but it has some problems. First, notice that the bottom diagonal line extends from the root to the upper-right-hand corner. This illustrates the phantom taxon problem, which is actually very commonly seen in students' cladograms drawn for exams (but wrong). Notice there is a node joining mammal to a continuation of the bottom diagonal line that ends at the far right, as an unlabeled terminal node. This extra taxon makes the cladogram nonequivalent to A-D above. It would be counted as incorrect, for example, on an exam. 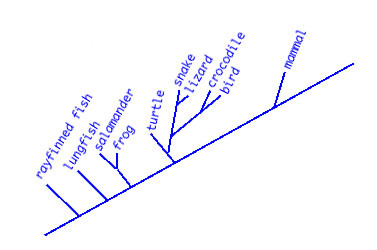 To correct it, always make sure the lower diagonal line ends at the last terminal node, as in the cladogram below. This modified cladogram is now equivalent to A-D above but, while it is technically equivalent, it could be improved. The second problem with both this and the last cladogram is that they reveal subtle problems with the way their artist could be viewing evolution. 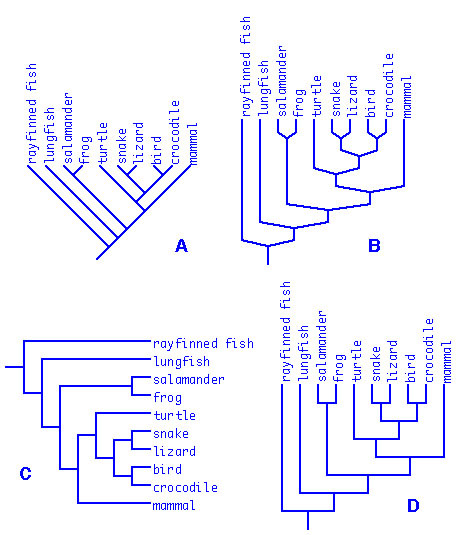 Notice that there is a ladder-like arrangement of taxa, from the "primitive" fish to the "advanced" mammal, implying that the right-hand taxa are progressively more advanced than those to the left. This is not how evolution works! The lungfish may be primitive in many respects, but in others it is highly advanced. Lungfish living today did not stop evolving after they last shared a common ancestor with the mammal. In this class, try to avoid referring to taxa as primitive or advanced. These are terms that are best reserved for particular traits that members of an organism have. This point is implied when one puts all of the terminal taxa at the same level, generally either across the top (Figs. A, B, and D) or in a single column (Fig. C). So the point here is that bushy cladogram style is generally preferred to ladder-like cladogram style. This page was first written on August 30, 2000 and last modified on September 14, 2000.